We'll go out on a 'limb' and say that it isn’t every day that you hear someone talk about visiting Bucharest, Romania, but this Eastern-European capital, in our opinion, is a hidden gem. Take our word for it; this is a place you’re going to want to visit! Moreover, visit soon, since it won’t be long before this wonderful city becomes a huge tourist destination. Enjoy it now, and you’ll be able to walk through the most charming and historic places without bumping the shoulders of hundreds of other tourists. We spent a month in Bucharest and loved just about every minute of it. We walked everywhere we could, and took either public transportation or Uber everywhere else. Along the way, we picked up a bunch of tips and things to know before you visit. As we do, we spent time gathering all the information we could on the best things to see and things to do in Bucharest. It’s a city with a mix-mash of culture and architecture, so hold tight and enjoy the city! These points of interest weren't on our sightseeing map, but walking around town led us to these hidden gems! Clockwise (from the left): The colorful umbrellas at Pasajul Victoria, the Slava Infanteriei Monument (Infantry Glory Monument) at Kiseleff Park, the Dambovita River runs through downtown Bucharest, the exterior of Muzeul Nanional George Enescu caught our attention when we walked past it. To possibly make your research on sightseeing in Bucharest (and other destinations) easier, we’ve kept our maps with all of the information we gathered (accurate at the time of our sightseeing). Finding hours, prices, and general information can sometimes be challenging, so we’ve tried to include these details on our maps and provide appropriate links below. And finally, not every attraction is suitable for every visitor, but the copywriters and marketing departments for the destinations sure make it sound like it. How many times have you read “Great for kids and adults alike” and shown up at the venue to wonder why anyone over 20 years-old without kids would go out of their way to be there? Below we’ve included our itinerary with tips, impressions, and our takeaways on each place that, when combined with the official attraction information and website, may help you decide if it’s a destination for your travel adventure or not. NOTE: We used this sightseeing map for our personal sightseeing adventures, because of that, some notes may not make perfect sense, and some information could be outdated. Information on this map was valid at the time of creation. All prices are shown in US dollars but are actually Romanian Lei (local currency). That being said, feel free to save it to your Google account and use it as a starting point (or modify it accordingly) for planning out your personalized itinerary in Bucharest. By far, just like most other places we visit, our favorite thing to do while sightseeing was walk around the city. Going from destination to destination, walking is the best way to see and explore the town in a way you never would be able to on a train, in a car, or even on a bus (Green Eggs and Ham anyone?). When we’re walking we can take a detour down the interesting street we pass, or walk through a park that wasn’t on our map. We also get a feel for the locals and how they live. 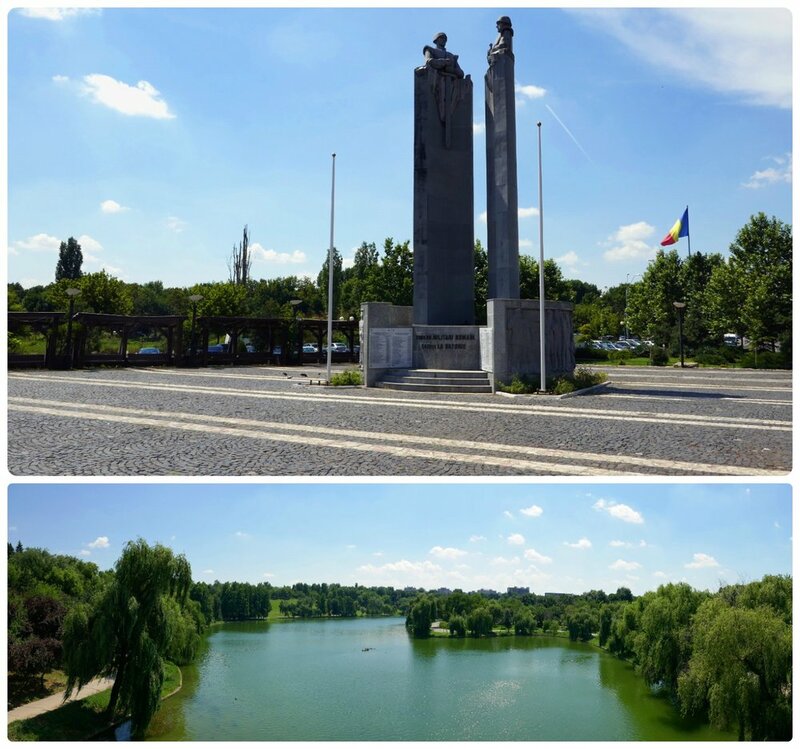 So, our absolute number one tip to sightseeing in Bucharest is to walk around! Walk the neighborhood you’re staying in, wander along the Dambovita River (‘Dâmbovița’ in Romanian), explore Old Town, meander through the city’s parks, and walk everywhere in between. We found that most of city center had sidewalks, making it easy to walk around. However, walk with caution, as there were areas where the sidewalk hadn’t been repaired and potholes, or loose stones were common. Additionally, as pedestrians, we try to always be aware of vehicles and to be on the defensive. However, we found that in Bucharest, some drivers are more aggressive than in other places we've visited, and they didn't always see and/or stop for us. When we explored Bucharest by foot, we found many interesting places! 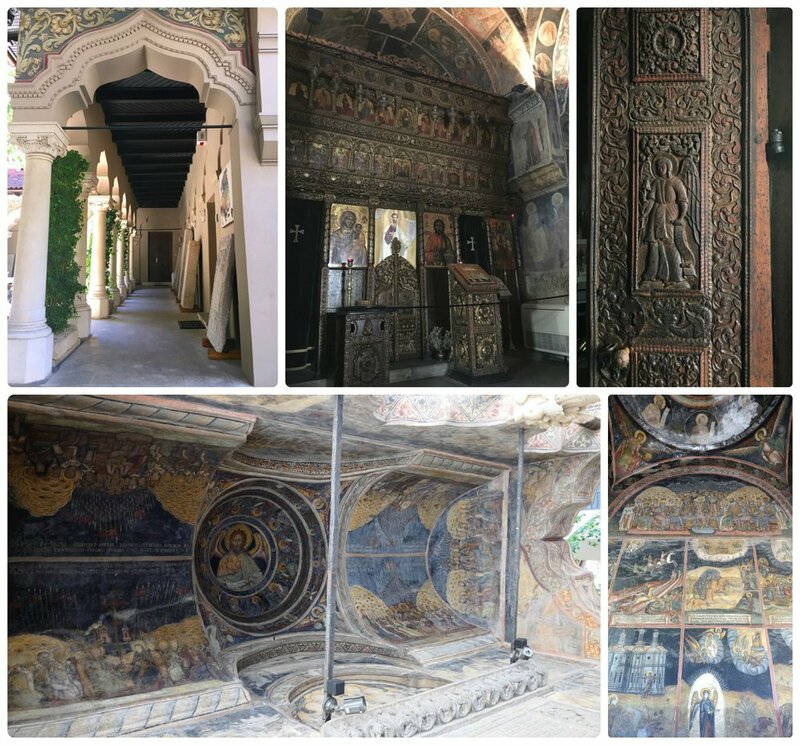 Left to right: The exterior (top left image) and interior (bottom left) of White Church Parish (Biserica Alba), a walkway through Kisleff Park, the National Geology Museum. Bucharest has gained a reputation as “The little Paris of the East”, so it’s no surprise that Bucharest has it’s own Arc de Triomphe, known as Arcul de Triumf. It’s located in the northern part of city center, specifically at the intersection of Kiseleff Road and Maresal Alexandru Averescu Blvd. While it isn’t as detailed or as large as the Triumphal Arch in Paris (Arc de Triomph), it certainly commands attention. It’s also not the first arch built in this spot; the first arch was quickly built out of wood in 1878 as a place for Romanian troops to pass under in celebration of Romania’s Independence. In 1922, after World War I, another temporary arch was built in its place, although it was demolished in 1935 to make way for the current Triumphal Arch. Each December 1st, a parade passes through the 85 foot tall archway to celebrate the Romanian holiday, Great Union Day. There are stairs inside the archway, for visitors to climb to the top, however it’s only open on special occasions. Sadly, unlike in Paris, there isn’t an underground pathway or passage for visitors to safely cross to the center of the roundabout to admire the archway up close. The Triumphal Arch is a great sight from afar, however, don't miss the detail on all sides of the arch. It's unfortunate that visitors are allowed to go to the top of the arch only on rare and special occasions. Next to the Triumphal Arch (Arcul de Triumf) is Herastrau Park, which is well worth the time to visit. In particular, we found the history of the land where the park now stands most interesting. Archeological finds suggest that the area has been inhabited by human settlements dating back to the Paleolithic era. Even more interesting, archeologists have found bones of extinct woolly mammoth and rhinoceros in the area. The park is huge, spanning 462 acres, of which Herastrau Lake takes up nearly 70% of the space. Since it’s located in a desirable area of town, it has, over the years been a promenade and lake front for the city’s wealthiest residents. Although it fell into disrepair after the 1989 revolution, in recent years the park has once again become a popular place for residents and visitors. Clockwise (from the top): Sergio posing in front of the fountain (Shannon here: yes, I may have 'coerced' him), there were several statues and sculptures placed throughout the park, on a small pathway in the park we found these two large vases, a picture of a map of Herastrau Park was useful in finding our way around the expansive area, at the entrance is the well-known statue of Charles de Gaulle. There are two main entrances to the park. If you're coming by car, enter at the far end of Saseaua Kisellef (opposite Casa Scanteii), as there’s a limited amount of parking available. Otherwise, if you’re entering by foot, we recommend entering at Piata Charles de Gaulle, which is near the Aviatorilor metro station. Gracing the entrance of the park is a statue of Charles de Gaulle, which was actually voted the 3rd ugliest statue in Bucharest in 2010 by Adevarul, a Romanian newspaper. 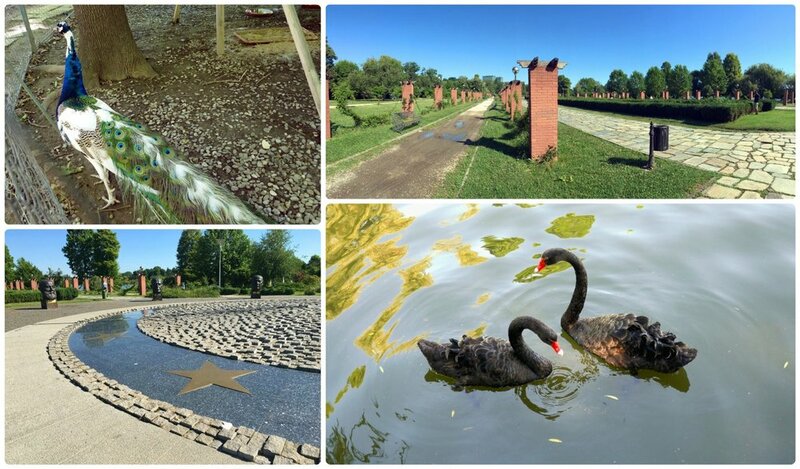 While walking through the park, you’ll see that many notable and historical figures are honored with statues. For those Michael Jackson fans out there, be sure not to miss the memorial to him on Aleea Michael Jackson, the pathway adjacent to the Arcul de Triumf. There’s plenty to do within the park, more than you could likely fit into your visit! The Village Museum – This is a large outdoor museum featuring 272 authentic peasant homes, farmsteads, wind and watermills, and churches from the historic regions of Transylvania, Oltenia, Dobrogea, and Maldovia. To make things more enjoyable and informative, exhibits have signs indicating what region a structure originally came from. Most buildings here date back to the mid-19th century, however there are a few dating back to the 1700s. Entrance to the museum is 10 Lei for adults, 2.50 Lei for students and children. Check visiting information for the most up-to-date information and entrance locations. Herastrau Adventure Park (Parc Aventura Herastrau) – This adventure park has four courses of varying difficulty; one for kids aged four to seven and the others for kids eight and above. Tickets for children are 35 Lei (45 Lei for adults) and are valid for two hours. An additional hour can be purchased for 15 Lei (20 Lei for adults), however the additional hour isn’t needed if your goal is to complete the courses. Outdoor Cinema – During the summer (when we visited, the cinema ran from July 7th through August 6th), an outdoor cinema plays movies every Friday, Saturday, and Sunday starting at 8:30 pm. There’s no cost to sit, relax, and view a movie. Visit their Facebook page to learn more about what’s playing and the current summer viewing schedule. Teatrul de Vara – It’s a summer outdoor theater that features Romanian theater. Visit their website for updated show information and to purchase tickets, and be sure to use your web browser’s translate feature, since the site is only in Romanian. Boating on the Lake – The park surrounds Herastrau Lake, and in the summer, it’s a popular spot for boat trips. Head to the jetty (‘debarcader’ in Romanian) behind the Hard Rock Café, to board a boat or catch a shuttle boat to the opposite side of the lake. Fishing – The lake is filled with carp for fishing. The cost to fish is 50 Lei, but according to the few locals we asked, it’s a bit on the expensive side. Walking/Jogging/Cycling – A 6 kilometer (3.7 mi) path runs the perimeter of the park and is great for walkers, cyclists, and joggers. Bikes can be rented all over town from i’velo stations, including a station that's adjacent to the park and the Arcul de Triumf. Check locations and pricing details at i’velo’s website. Island of the Roses (Insula Trandafirilor) – If your able to visit while the roses are in bloom, the island will be one of the most beautiful sights you’ll see. However, if you’re timing isn’t ‘just right’, exotic birds are also kept on the island, making it a cool place to visit anytime of the year. We saw black swans in the pond near the bridge, and then followed the cries of the peacocks to find three of these magnificent birds, not too far from the swans. Clockwise (from the top): The peacocks were magnificent and had unmistakable cries, in the center of the Island of Roses was a beautiful walking path, the black swans were an exotic sight to see, on the Island of the Roses is a monument commemorating the founders of the European Union. Playgrounds – For visitors with children, there are several playgrounds spread throughout the park that are perfect for youngsters. Fountains, Alleyways, and Pathways – As you wander through the park, you’ll find yourself on tree lined alleyways that lead to fountains and branch off to dozens of other pathways. Swimming – You may spot kids taking a dip in the pond, however, swimming is prohibited. Moreover, from the looks of the water, you may want to consider cooling off back at your hotel room or Airbnb instead (use our link to get $40 off your first Airbnb stay!). Eat and Drink – There are plenty of stands/kiosks located throughout the park to buy snacks, drinks, and meals. Formal ‘sit down’ restaurants include the Hard Rock Cafe, Casa di David, Berăria H, Il Casio, Embassy Park, Restaurant Herastrau, and Pescarus. Top to bottom: We entered at Piata Charles de Gaulle and were treated to a path lined with statues, the lake in the center of the park is expansive, throughout the park we found areas with flowers and lawns that were perfect for a moment of relaxing. Bucharest was built around its churches and monasteries and traditionally historic neighborhoods were named after the church they accompanied. These historic buildings of worship are some of the oldest buildings in the city, their walls holding centuries of culture, religious practices, stunning medieval architecture, and Byzantine frescoes. Regardless of your religious beliefs or none at all, these churches are a wonderful collection of historic art and are unique, when compared to the Gothic/Romanesque Cathedrals seen throughout Europe and of the Mosques in Islamic regions. Unfortunately, during the communist era (1970s and 1980s) in Romania, entire sections of Bucharest were demolished, redesigned, and reconstructed. For example, the Palace of the Parliament, which is the second largest administrative building in the world (second to The Pentagon), was built in city center on the land where nearly 9,000 houses, churches, synagogues and other buildings were demolished. Eugeniu Lordăchescu, a civil engineer, came up with an innovative way to save many of the churches in the areas scheduled for reconstruction. To save time, rather than deconstructing the monasteries and churches one block at a time and then re-building them in a new location, Lordăchescu had a breakthrough idea when he saw a waiter carrying drinking glasses on a tray. Based on the idea of adding a tray to the bottom of the building, the land beneath the building was dug out, the churches were lifted, and the severed foundation was supported by large concrete. The churches were then moved by laying tracks and using hydraulic pulleys and levers. While more efficient than moving the buildings block by block, it still took quite a bit of time and not all churches scheduled for relocation could be saved in the haste of the new construction projects scheduled throughout the city. Many of the monasteries and churches that were saved were relocated to spaces where they’re now towered over by large communist block buildings. Read more on this story, The Great Escape: How Bucharest Rolled Entire Churches to Safety at The Guardian. This Romanian Orthodox church is located only a block away from Arcul de Triumf and is dedicated to the Archangels Michael and Gabriel. The structure was completed in 1938, but work on adding and completing details of the church were resumed in 1946 and continued for decades. The mosaics inside Cașin Monastery are very impressive! This Orthodox Church, built between 1720 and 1722 in the Brancovenesc style, is located on the famous and prestigious Victory Avenue. It was nearly destroyed in an earthquake in 1838, but was rebuilt and restored between 1859 and 1860. From the outside to the inside, Kretsulescu Church is worth seeing. If you visit, your memories of the inside will need to be enough, as photography isn't allowed inside. This Orthodox monastery and church dates back to 1724, but it underwent a partial rebuild after an earthquake in the early 1900s. The monastery was originally built near an inn by a Greek Monk, which was a common practice at the time to provide financial support for the monastery. You'll find this church tucked away about a block from Victory Avenue. While visiting, be sure to admire the stone work and wood carvings on the main doors. Also, surrounding the peaceful courtyard is a collection of tombstones that date back to the 18th century. More information can be found on the Staropoleos Monastery’s website. Stavropoleos Church is located in city center and is a popular spot for tourists. Even though it's a small church, the ornate detail, murals, and serene courtyard made it clear to us why it's a popular place to visit! This synagogue was built between 1857 and 1867 and was then restored in 1945, after World War II. It’s a copy of Vienna’s Leopilstadt-Tempelgasse Great Synagogue. 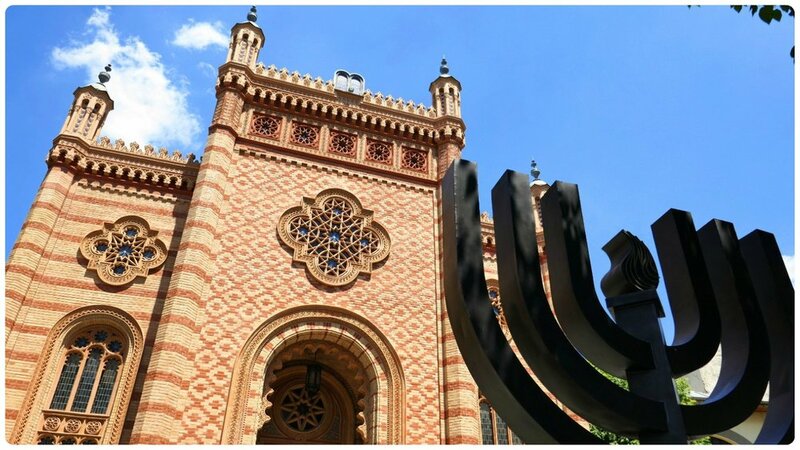 In front of the synagogue is a memorial for the Romanian Jews who died during the Holocaust. Find additional information on their Facebook page. The Coral Temple Synagogue was a sight to see with the monument in front and the bright blue skies. Named after its founder, Mihai Viteazul, this monastery is one of the oldest buildings in Bucharest, and dates back to 1594. A unique design element of this the monastery is that, like a fortress, it was protected by stonewalls. Over the years, it’s served many purposes, including a residence for leaders, a military hospital, a medical school, and the site of the National Archives of Romania. In the courtyard, archeological finds, including pottery and relics that date back 3,000 years have been found. Additional information can be found on the Mihai Voda website; however, it’ll most likely need to be translated. All images are of the Mihai Voda Monastery. Clockwise (from the top): Lamps like these can be seen in many of the monasteries in Bucharest, under a tree in the garden was a cross, the exterior of Mihai Voda Monastery, the wood work inside the monastery was amazing in its detail, the chandelier hanging from the dome was breathtaking. This church was built between 1881 and 1885 in a Neo-Romantic and Neo-Byzantine style. The building’s exterior, interior, and the small garden in front of the church are beautiful sights to see. We found it most interesting that this is one of the most popular places for wedding ceremonies and that there are never funerals held here. Visit the church’s website. 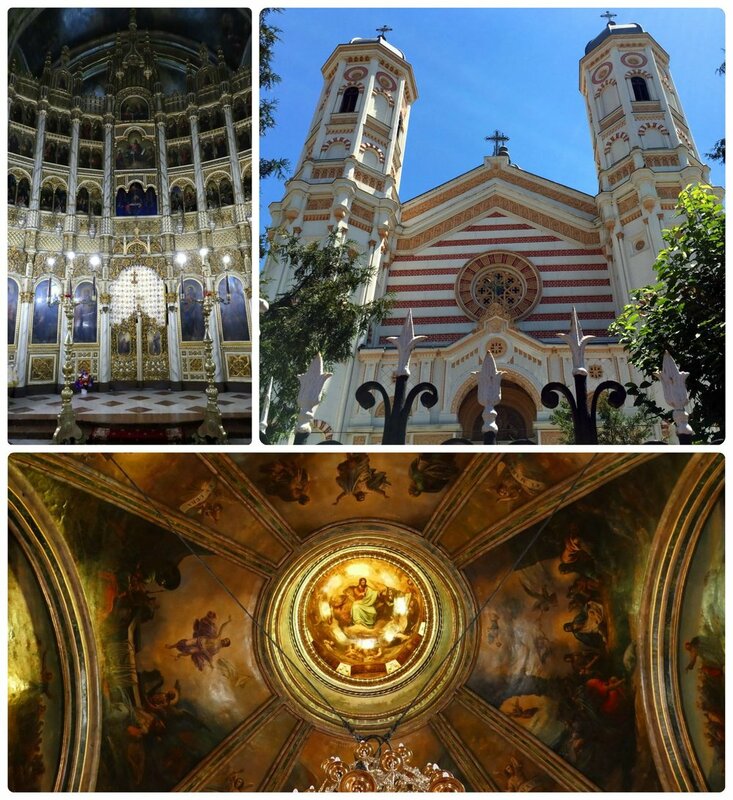 The gardens and the exterior of the Lady Balasa Church are beautiful, and the interior is stunning. 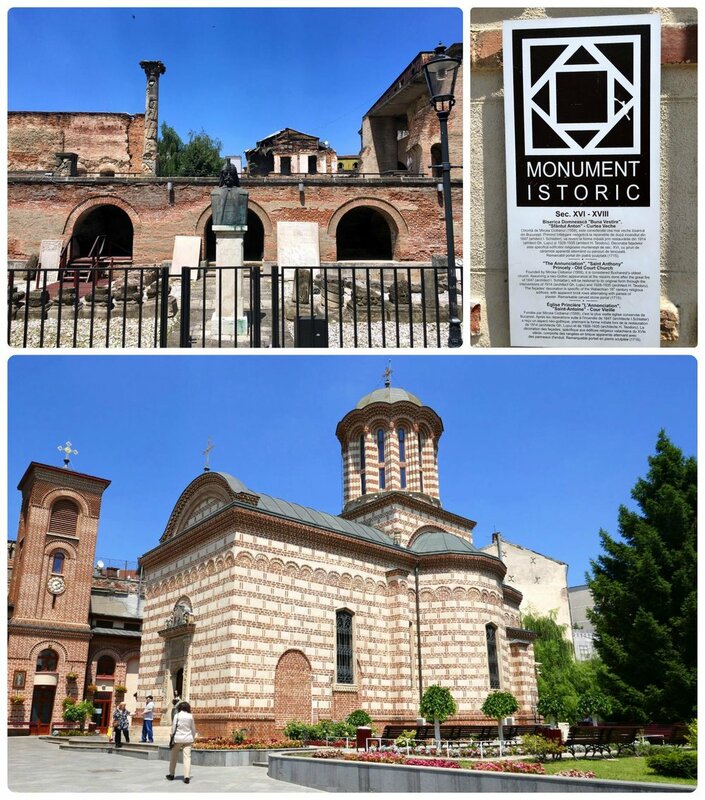 When visiting Bucharest, you'll likely notice 'Monument Istoric' signs posted on historical landmarks throughout the city that give a brief historical description of the site. Built on the site of Paleolithic and Dacien Era settlements, the monastery was founded in 1568 as part of a large complex. The current monastery was completely renovated between 1969 and 1974. Visit the monastery’s website. To get to Radu Monastery, you'll need to make a short but steep walk up a hill. However, once you enter the monastery, you'll be rewarded with absolutley beautiful murals. This church is quite large when compared to the other churches on our list. It was built between 1852 and 1858 and has since sustained damage from extremely strong wind, earthquakes, and work on the underground transportation system. Fortunately, repairs and restoration have maintained the condition over the years, despite the damage. During our visit, Saint Spyridon The New Church was under renovation, however, what we were able to see was quite beautiful. In particular, the golden dome had murals that beg visitors to look up. This church was completed in 1658 and was built in a Brâncovenesc style. Unfortunately, since then all of the original art was destroyed, except for the Constantin and Helen icon, which are the patron saints of the church. The frescoes you see today were added in 1923. This Orthodox Church is the central place for the Palm Sunday pilgrimage and is known for its acapella choir. While planning your visit, especially during holidays, keep in mind that lines of pilgrims can exceed a couple of miles (several kilometers). Check the church’s website for information. When we visited Patriarchal Cathedral of Saints Constantine and Helena there was a mass in progress, so we respectfully didn't enter. However, we were content with the beauty of the courtyard and surrounding buildings that stood out in the bright blue sky. In particular, the gold mosaics sparkled, as the sun was shinning directly onto the front of the monastery. When visiting the Antim Monastery, you’ll enter by walking through the archway at the bottom of the bell tower which was added in 1857. The monastery itself was built between 1713 and 1715 and was originally intended to be a place for fallen women and refugees. While there, be sure to pay special attention to the paintings, as well as the intricately carved wooden doors. The most interesting part of this monastery is the story of its founder, Antim. Antim was a polymath, he knew many languages, was a craftsman, a printer, a book editor, a bishop and later, became the Metropolitan of Wallachia. He was originally from Georgia, but had an eventful life that eventually brought him to Wallachia (a region in Romania), where he founded the monastery in Bucharest. Visit the monastery’s website for more information. From the murals under the archway of the bell tower to the intricate wood carved doors, the Antim Monastery should definitely be on your sightseeing itenerary. A walk down Victory Avenue is a walk down one of the most prestigious and main avenues in the city. It was built in the late 17th century under the order of Prince Constantin Brancoveanu to connect his palace, near the Dambovita River, with land in the Mogasoaia village. 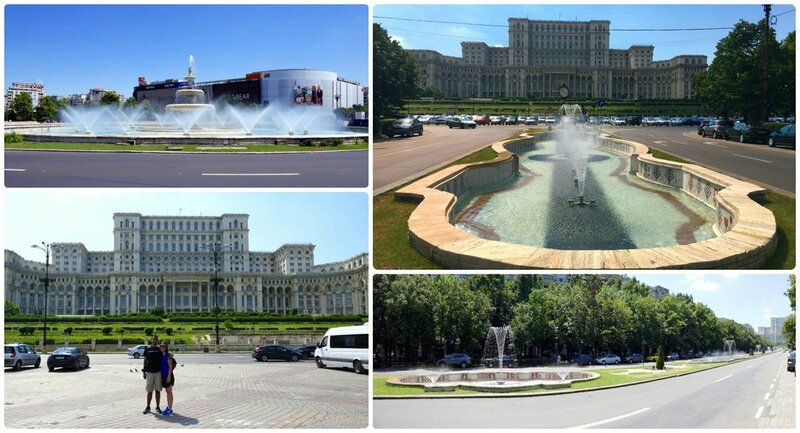 The avenue connects two main squares, United Nations Square (Piata Natiunile Unite) and Victory Square (Piata Victoriei). Here you’ll find upscale shopping, many tourist destinations, and a mix of medieval, communist, and modern architecture. Originally, since most areas throughout the city would become muddy and impassable during the rainy season, this road was covered in wood, and wasn’t paved with stones until 1825. By the 18th century, Victory Avenue had blossomed into the fashionable area to shop and dine that it’s today. This central concert hall was opened in 1888 and is home to "George Enescu" Philharmonic and of the George Enescu annual international music festival. For information on concerts, visit the Filarmonica George Enescu website. The ceiling of the concert hall isn’t to be missed; it’s decorated with anthropomorphic and animal motifs that were inspired by Romanian folklore. Experience Romanian history through the 807 square foot mural that depicts 25 significant events in Romanian history. This building is absolutely gorgeous and was rightfully included on the European Heritage Label website in 2007. Opposite the National History Museum, the facade of this building is remarkably beautiful. It was built between 1897 and 1900 and is the headquarters of Romania’s oldest bank, CEC. This neoclassical building is huge, covering over 86,000 square feet and originally constructed between 1894 and 1900 as the headquarters of the Romanian postal service. In 1970, it became home to the National History Museum, housing over 600,000 pieces of historical significance. Sights you shouldn’t miss at this museum include: a cast of Trajan’s Column, the Romanian Treasury, and the Romanian Crown Jewels. Visiting information and current exhibitions can be found on the museum’s website. Clockwise (from the top): The exterior of the Romanian Athenaeum, The National History Museum is a huge building that takes up most of the block, the Palace of the Savings Bank is a building with such beautiful architecture that it's hard to believe it's a bank. It’s a ‘V’ shaped arcade that dates back to 1891, when it was constructed as a passage between Victory Avenue (Calea Victoriei) and the National Bank. The arcade is covered with yellow glass and at street level is lined with cafes, hookah shops, and restaurants. Pasajul Macca-Villacrosse is a 'V-shaped' shopping gallery that in the center meets with a domed roof. At ground level, there are shops, cafes, and restaurants to enjoy, but be sure to look up and take in the yellow glass ceilings. Built in 1852, it’s considered one of the most historic restaurants in Bucharest. Today it’s a popular hotel and restaurant. Built in 1911 with a French Neoclassic exterior to serve the Romanian Army. Today the building is used for art exhibitions and cultural events. A restaurant and terrace are open to the public. This monument is known by many colorful names (‘the potato on a toothpick’, ‘olive on a cocktail stick’, etc. ), however, it’s a memorial to commemorate the Romanian Revolution of 1989. It was inaugurated in 2005 and is located in Revolution Square. The marble pillar is 82 feet high and is topped with a metal crown. Surrounding Revolution Square is the Royal Palace, The National Art Museum, the Atheneum, the Central University Library, and many other important buildings. Prior to the 1989 Romanian Revolution, this square was known as Palace Square. However, during the historic event, over 100,000 people gathered in protest of the Communist dictator, Nicolae Ceausescu, and it was then that it became known as Revolution Square. It's now home to The Memorial of Rebirth and the Wall of Remembrance with the inscribed names of those who died during the revolution. The palace was built in 1912 and in 1950 became the headquarters of the Ministry of Interior and Administrative Reform. In 1958, it housed the Central Committee of the Romanian Communist Party, and after the 1989 Romanian Revolution it became home to the Romanian Senate. You’ll find this art museum in Revolution Square, inside the former Royal Palace building. The museum houses the largest collection of Romanian art in the country and was established in 1950. Visitor information, including hours and ticket prices can be found on the museum’s website. Visit Revolution Square and you wont be able to miss the Rebirth Memorial and the park surrounding it. While you're there, visit The National Museum of Art of Romania, along with the art inside, the architecture is worth admiring. Located behind the National Art Museum, it was built in 1960 and formally housed the congresses of the Romanian Communist Party. Today, it’s a concert hall and event venue. Find information on upcoming shows and events on Sala Palatului’s website. This is the oldest hospital in Bucharest, dating back to 1704. However, the Neoclassical building it currently resides in, was built in 1888 after an earthquake in 1802 destroyed the original building. While admiring the building, you may notice the statue in the courtyard (right side); it’s in honor of Mihai Cantacuzino, the founder of the hospital. Keep in mind that since it’s still an operating health care facility visitors aren’t allowed unless on official business. However, on the left side of the building (when facing the hospital) and slightly in front of the hospital is Coltea Church, which is open to visitors. Unlike the hospital building, the church survived the earthquake and the building, estimated to have been built in the mid-17th century, still stands today. The church is dedicated to Saint Martyr Paraskeva of Rome. Clockwise (from the top): Coltea Hospital seen from the front of the church, be sure to look up at the arches when inside Coltea Church, the alter is magnificently ornate, Coltea Hospital looks more like a palace than a hospital. An often overlooked gem in Bucharest, Old Princely Court was built in the mid-15th century by Vlad III Dracula, also known as ‘Vlad The Impaler’. The site today is of the ruins that were excavated in the mid-20th century. Archeologists believe that the ground floor was unusually high, as it was built above the extremely large dungeons. Today you can see the water supply system, the Turkish Baths, and some of the interior murals. Of course, don’t miss the bust of Vlad the Impaler which reigns over the Old Princely Court. At the time of our visit, tickets were 5 Lei, except for the first Saturday of the month when entrance is free. While here, be sure to visit the beautiful Church of Saint Anthony (Biserica Sfântul Anton) which is next to Old Princely Court (just east of it), and is also a popular tourist destination. The history of Old Princely Court is fascinating! While you're visiting, be sure to walk just a short distance down the street to visit the beautiful Sfântul Anton Church. Don't miss the 'Monument Istoric' signs that provide an overview on the history of the site. The Fire Tower has a long history in Bucharest. Standing 42 meters tall (137 feet), this tower was built in 1890 to watch over the city for fires. As one may expect, over time taller buildings were built that overshadowed the Fire Tower, thus making it impractical as a watchtower. So, in 1960 the tower was turned into a small museum commemorating firefighters, and today the observation deck is accessible to visitors. Although you’ll likely need to translate the page, visiting information is available on the Fire Tower website. There are many modern shopping malls and even a few historic shopping arcades around the city; however, AFI Cotroceni is so much more than a shopping mall. Touted as the city’s largest and most popular mall with over 300 stores, you can also enjoy a movie at one of the cinema’s 20 screens, see a movie at the IMAX theater, skate at the year-around ice rink , take the kids to the play in the kids area or to the kids’ rides, and scale the adventure course. If you’re into video games, don’t fret, there are a few options for you too: fun center, laser tag, virtual reality, Romotion Simulator, and Smart Balance hoverboards. As if that wasn’t enough, before you top it all off with a meal in one of the many restaurants, take a ride on the indoor roller coaster. See all of the options on the mall’s amusement page. Finally, if none of those ideas causes you to put this spot on your must-see attraction list, then maybe the bright, clean architecture will draw you in! AFI Cotroceni - Clockwise (from the top): The indoor roller-coaster in the mall, the ice-skating rink, looking down the mall with the shops and brightly colored umbrellas above head, the adventure wall in the mall, above the adventure wall was a spider and its web. Cotroceni Complex dates back to 1678 when the ruler of Walachia, Serban Cantacuzino, ordered a monastery and Baroque Palace to be built. Over the centuries, it’s been home to Romanian Royalty, being embellished and modified by each ruler. As of 1991, this has been the home of the President of Romania. The Cotroceni National Museum is open to the public and is part of the old wing. The mission of the museum is to give visitors insight into the past ages of the palace, through a tour of several rooms within the old wing. Collections in the museum include nearly 20,000 objects that are divided between plastic arts, decorative arts, numismatic, medals, history, and archaeology. Guided tours are required to visit the museum and must be booked a day in advance. Book online and be sure to bring your passport or an acceptable ID with you (check the website). Don’t be confused by the different names, the common name is Crețulescu, while an alternative spelling is Kretzulescu. Cretulescu Palace was originally built for the Crețulescu family in 1902, and was then purchased by the city in 1927. It has since been used for various administrative institutions, and from 1972 to the present, it’s been the headquarters of UNESCO’s European Centre for Higher Education (UNESCO-CEPES). Sadly, the building isn’t open to visitors, but it’s an architectural point of interest. Unfortunately, when we visited we found the building hadn’t been up kept, although it’s not hard to see that it was once an architectural beauty. Cretulescu Palace is next to Cișmigiu Gardens, making it a great combination to see/visit. 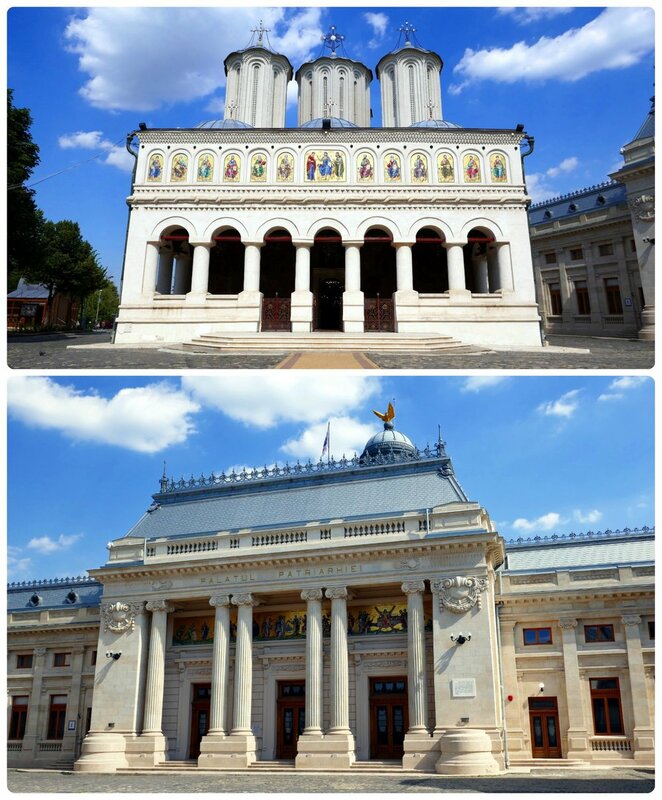 Located in Sector 5, along the Dambovita River, the Palace of Justice was built between 1890 and 1895. Built in the French Renaissance style, it reminded us of why Bucharest is often referred to as “the little Paris of the East”. It currently houses the Bucharest Court of Appeals. Clockwise (from the top): The exterior of the Palace of Justice, the street in front of Cotroceni Palace is lined with Romanian flags, the front of Cretulescu Palace. If you’re a fan of contemporary and modern art, then this is a place to add to your attractions list! Exhibits include Romanian artists as well as international artists. The museum is located within Parliament Palace, although the entrance for the National Museum of Contemporary Art isn’t through the visitor entrance of Parliament Palace. Instead, it’s on the opposite side, specifically, look for entry E4 on the southwest side of the building. Exhibits rotate throughout the year, so check the MNAC website for details on current showings and visiting information. The Palace of the Parliament, formerly known as the Palace of the People (Casa Poporului), is one of the main attractions in Bucharest. The building is considered to be the second largest administrative building in the world, second only to The Pentagon. It was the pet project of Communist leader Nicolae Ceausescu, and is often said to be a grandiose and superfluous show of Communist power. The building was meant to be the crowning glory of Bucharest and hold all functions of the then Communist state, as well as being a residence for Ceausescu and his family. Construction began in 1983, and the building was nearing completion when the 1989 revolution broke out. The building is 12 stories high and has eight underground levels, with the total size of the building coming in over 3.5 million square-feet. Official numbers have never been released, but it’s said that it took 20,000 workers and 700 architects to build the massive structure. Today, large parts of the building go unused. Clockwise (from the top): Inside there's a screen with the times of the tours for that day, us posing infront of the Palace of the Parliament, it's hard to get the entire building in frame - but we tried! A guided tour is required to see the inside of the building. Find information for booking a guided tour on the Palace of the Parliament website. Visiting information, including the different tours, the cost, and rules for visitors can be found on the website as well. We recommend calling a day in advance, between 9 am and 4 pm, to book the tour. Call + 40-733-558-102 or +40-733-558-103. For the best views of downtown Bucharest, be sure to schedule the tour with access to the balcony. The standard tour takes about 45 minutes, while the addition of the balcony adds about 15 minutes. If you wish to take photographs, you’ll need to pay an additional fee of 30 Lei. Be sure to schedule the tour in advance and bring your passport (or international ID) with you. Since credit cards aren’t accepted, although there’s an ATM in the lobby, we’d recommend bringing cash with you in case the machine is out of order. The main entrance to the Palace of the Parliament can be hard to find, probably due to its sheer size. The front of the building, with the balcony that Ceausescu intended to use when speaking to ‘the people’, can be seen from Libertatii Blvd and the main street Bulevardul Unirii. However, the entrance for visitors is on the northern side of the building, on Natiunile Unite Blvd, across from Izvor Park. Aside from the visitors entrance to the Palace of the Parliament, a great place to view the building and get pictures of it is from Constitution Square. It’s said to be the largest square in Romania, however, unless there’s an event or parade taking place, it’s really just a place to get pictures of the Palace of the Parliament. Union Boulevard (Bulevardul Unirii) was designed to be Bucharests’ version of the famous Paris boulevard, Champs-Élysées. It’s a fantastic fountain lined street with expansive views of the magnificent Palace of the Parliament. Palace of the Parliament is so large that it can be seen in all directions. We walked all the around it and then down Bulevardul Unirii to enjoy the views of the fountains with the Palace of Parliament in the background. Bucharest is much more than a city center full of busy streets, large buildings, and noisy traffic; it’s also a place where locals and visitors can escape to wonderful parks and gardens. Already mentioned, Herastrau Park (Herăstrău Park), is one of the most popular parks in the city. However, there are many more to explore! Technically, it’s debated whether it’s a park or a garden. Either way, it’s one of the most central green spaces in Bucharest. It surrounds a beautiful lake that can be crossed by bridges, floated on by boats in the summer, or skated on in the winter. The garden was completed in 1860 and is home to over 30,000 trees and plants. 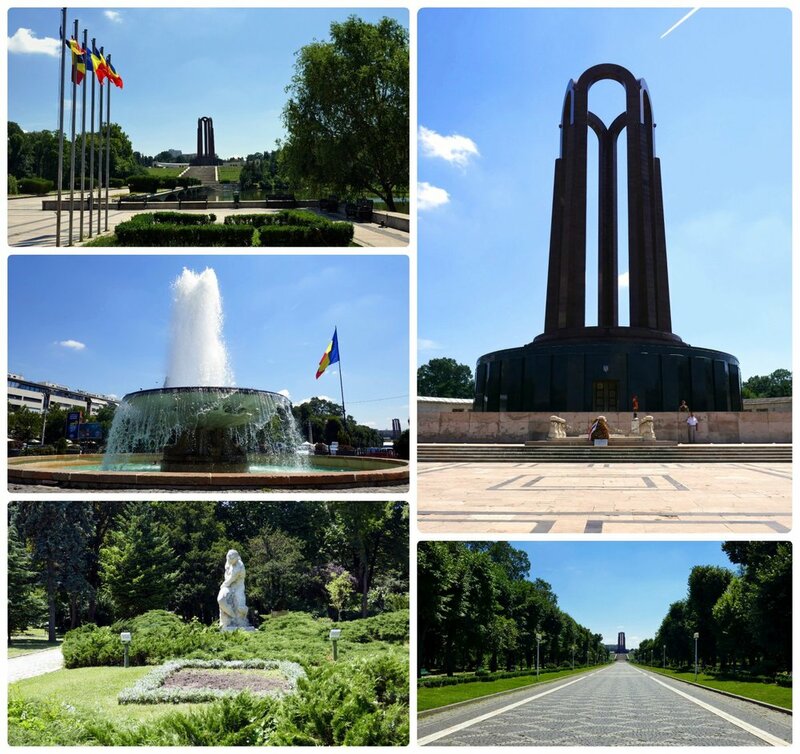 When visiting be sure to enjoy the Roman garden and the effigies of famous writers, and take a moment to commemorate the French troops killed on Romanian territory during World War I at the Monument of French heroes (Monumentul Eroilor Francezi). Also, don't forget to stop at The Monument of American Heroes (Monumentul Eroilor Americani) which commemorates the 378 US soldiers who died in Romania during World War II. The park/gardens can get crowded during the summer, but it’s still a great place to take a break and walk around the lake’s mile-long perimeter. Kids will enjoy the playgrounds and adults will appreciate the rose garden and the many sculptures around the park. During good weather, kiosks are open in the park with snacks and drinks available for purchase. Information on the park, including events and a map can be found on the park’s website. Whether visiting for the entire day, or just for a break from the hustle and bustle of the city, Cismigiu Gardens is a great escape! Located further out of city center than other parks on our list, this park is located in Sector 6 and in the Drumul Taberei neighborhood. The park underwent redevelopment beginning in 2013 and was re-opened in 2015. In the center of the park is a lake, with a large walking bridge over it and a fountain and sculpture to the side of it. There are a planned set of heated green houses intended to house exotic plants, but unfortunately, they haven’t been completed yet. In contrast, the park is outfitted with a skate park, a kid’s playground, tennis courts, and a workout center. There are plenty of walking paths and the main area even seems to be equipped with mounted audio speakers throughout. It’s a very cool park that we hope will be completed soon. Tineretului Park has something for everyone. Clockwise (from the top): The workout area and basketball courts in the park, the lake in the center of the park with a contemporary fountain, over the center of the lake is a large arched pedestrian bridge, there are plenty of areas in the park that are covered from the sun by the shade of trees, while visiting be sure to take a stroll around the lake or take a break on one of the many benches. The gardens were completed in 1866 and were originally part of the Cotroceni Monastery grounds. The gardens were moved to their current location in 1884 and are now part of the Botanical Institute of Bucharest University. Rather than trying to ignore the industrial buildings in the background, it’s best to enjoy them as a unique background to an expansive botanical garden. The glass green houses are quite impressive, hold nearly half of the gardens species in them, and are designed in themed sections. Oh, and make sure the kids watch out for the Venus Fly Traps; we don’t want any lost fingers! Additionally, there are a couple of ponds and fountains that add charm to the site. If you’re up for it, don’t miss the small botanical museum, which can be found near the entrance gates. If you’re interested in visiting the museum, keep in mind that it keeps shorter opening hours than the rest of the garden. Collections within the museum are of dried, pressed, and preserved specimens in alcohol. Check the Gradina Botanica website for visiting information. The Botanical Garden was expansive and beautiful. When visiting, be sure not to miss the green house! This park is known as both Carol Park and Liberty Park. It was laid out in 1906 for the Romania in the World exhibition. The park underwent many changes during the communist era, including the name change from Carol Park (Parcul Carol I) to Liberty Park (Parcul Libertăţii). In the center of the park is a tree-lined promenade which crosses through the landscaped gardens and over the lake. It leads to a large Mausoleum, which was originally built in 1963 as a communist monument (Monument to the Heroes of the Struggle for Freedom of the People and of the Motherland, for Socialism) but in 1991 it was transformed into a World War I memorial. The crypts with communist leaders were removed, the remains transferred to other cemeteries, and remains of soldiers killed in World War I were placed to honor Romania’s Unknown Soldier. Throughout the park you’ll find additional sculptures, a Roman Arena (Arenelle Romane), places to eat, and playgrounds. The Unknown Soldier Monument is the largest attraction in Carol Park, however it's not all there is. When visiting, be sure to explore beyond the monument and see the statues, the lake, and water fountain. The park was created in 1965 as a recreational space, and it’s a great place to relax on the lake while on a boat ride or at a café. Pathways in the park are great for walking, jogging, and biking. In the middle of the park is Sala Polivalenta, a venue for concerts, sports, and events. Also, Oraselul Copiilor is a fairgrounds type amusement park that is located near Sala Polivalenta. The park is great for families, as it’s known for its many great playgrounds and places for picnicking. Tineretului Park is a large park that's great for breaks from the hustle and bustle of the city. 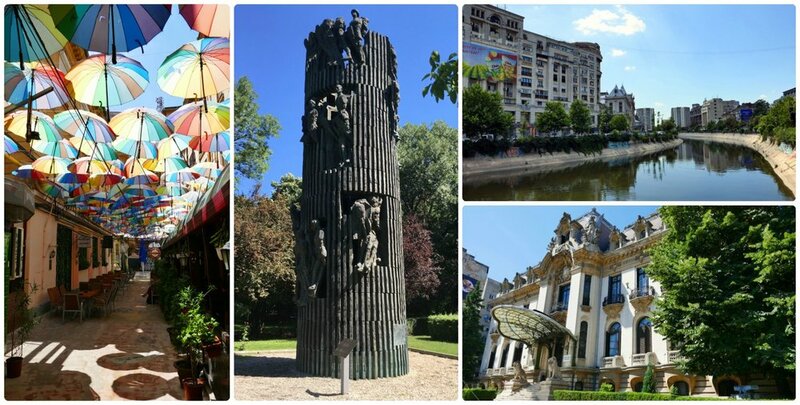 There's so much to see and do in Bucharest! However, what we couldn't capture here in photos is the best part, the culture and the people of Bucharest. We enjoyed our time in Bucharest and who knows, you may even find us here again. So, we'd dare to say that we think Bucharest should be on every travelers list of places to experience! Oct 5 Experience the Transfagarasan Road Trip in Romania!